It looks like some sort of Photoshop trickery, but this is exactly how it looked. This is Princess Cruises Island Princess, plowing into thick fog along the Inside Passage off Canada back in 2006. No horizon, no sky, no frame of reference. Thank goodness for radar. I suppose the unpleasant recent news about the disabled Carnival ship got me to thinking about my cruise ship photos. Happily, nothing went wrong with the ship on this excursion. I finally decided to upgrade from Lightroom 3 to Lightroom 4. That is not particularly pertinent to this post, except that is why I was digging through some older photos, doing a little quick experimenting with the new Lightroom. I ran across this one from my fog images shot in Wichita in 2011. All the way back in February 2011 – where did the time go? It struck me as pretty nice, I felt like I had unearthed a previously hidden treasure. That’s one advantage of digital, it makes it pretty easy for us to go back and review old material – sometimes you might find something interesting. 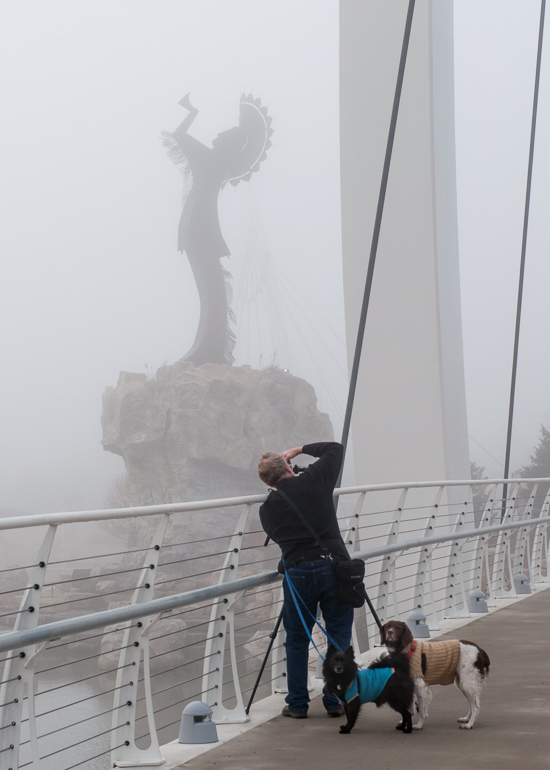 This is the good old Keeper of The Plains Statue, by artist Blackbear Bosin, standing in the fog. I’m running out of new fog images to post. Finally. This was an amazingly productive little photo outing in Belleville, Ks., on Dec. 1. Breaking the rule of thirds yet again.